Top Landscaping Software Lets Your Landscaping Ideas Come Alive! Easy to use landscaping software allows you to create your own perfect landscape designs virtually, so there's no need to work up a sweat! Patio, deck, lawn and garden plans  make them come alive in minutes even if you have no drawing skill at all. If you're like me, your mind is filled with landscaping ideas. Perhaps it's even your livelihood. Sometimes it's easier said than done capturing those landscape designs properly on paper. Landscaping software gives you the ability to design professional quality landscapes with ease! And if you need ideas, you can browse through wonderful examples of landscape designs... which lead to a flurry of new, creative landscaping ideas. 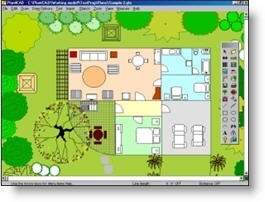 Simply put, landscaping software enables you to create your landscape designs right on your computer. You use drawing and graphic tools to develop your own landscaping ideas from start to finish like an expert. You'll want software that is easy to use, for sure. The best ones allow you to import a photo of your lawn and home, then you insert ready-made graphics you wish to add from the software's library. For instance, you might create a walkway from your front door to a garden you're designing. You can "drag and drop" trees and shrubs of your choice along the walkway you create. Next, insert some lighting along your walkway. Using different special effects, you can see how the area looks in the daylight, or at night under lights. Now create your entire garden, complete with spring flowers, annuals, water fountains, you name it. And wouldn't you like to know what your budding landscape design looks like years from now! You can, with landscaping software. By growing your plants by "years," you can find out before you spend time and money if the design you create now gives you the look you will want later! 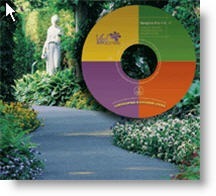 I recommend two outstanding landscaping software packages. GrowIt Gold Garden & Landscape Design software is a real find for the home landscaper as well as professional landscapers, nursery growers, and gardeners. You can add furniture, patio items, statuary, birdhouses, rocks, and other decor into your landscape design. GrowIt Gold's plant library is a global database. It contains plants from tropical to cool weather ranges, with growing tips for each category of plants complete with detailed graphics. It has easy to use tools that produce both 3D images and graphic drawings of your landscaping ideas. For business owners, GrowIt Gold has a fully functional inventory and invoicing software side. When you Visit GrowIt Gold, check out their slide show presentation - you'll get a great idea of the power of this landscaping software. For home landscapers that want real simplicity, you can't beat Imagine Pro 7.0 landscaping software. Imagine Pro 7.0 is the Silver Award winner from "TopTenREVIEWS" for landscape design software. With Imagine Pro, you can import a photo of your lawn or home site, or work from graphic drawings that make you look like a pro. Visualize your landscaping ideas by browsing the Image Library. Choose plants by growth rate, size, bloom season, sun and moisture needs. You'll be sure of your choices as you follow the built-in planting zone and hardiness maps! With ease you can make stunning changes and additions to your evolving landscape design using the extensive visual library of flowers, trees, and other landscaping features. Imagine Pro landscaping software also has great drawing graphics you can use to create a landscape design from scratch - no artistic ability required! Imagine Pro 7.0 landscaping software lets you resize any objects (plants, yard furniture, patio items) to your liking. You can also create details like shadows and lighting effects. Landscaping software can be a huge asset to anyone who does landscaping projects on a regular basis or once in a while. It will save you valuable time and the lion's share of hard work. Best of all for the homeowner, you'll know right from the start that your landscaping ideas will end up exactly as you envision them! The relative low cost of landscaping software will be worth it in the end.